Afonso III (Portuguese pronunciation: [ɐˈfõsu]; rare English alternatives: Alphonzo or Alphonse), or Affonso (Archaic Portuguese), Alfonso or Alphonso (Portuguese-Galician) or Alphonsus (Latin), the Bolognian (Port. 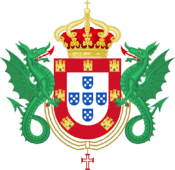 o Bolonhês), King of Portugal (5 May 1210 – 16 February 1279) was the first to use the title King of Portugal and the Algarve, from 1249. 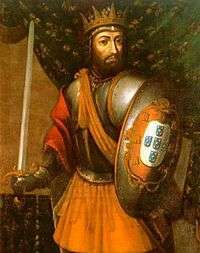 He was the second son of King Afonso II of Portugal and his wife, Urraca of Castile; he succeeded his brother, King Sancho II of Portugal, who died on 4 January 1248. In 1246, conflicts between his brother, the king, and the church became unbearable. In 1247, Pope Innocent IV ordered Sancho II to be removed from the throne and to be replaced by the Count of Boulogne. 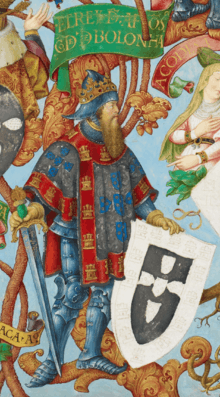 Afonso, of course, did not refuse the papal order and consequently marched to Portugal. Since Sancho was not a popular king and the order was not hard to enforce, he fled in exile to Toledo, Castile, where he died on 4 January 1248. 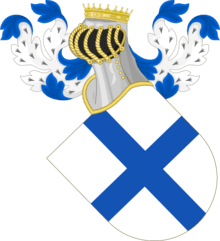 Until his brother's death and his own eventual coronation, Afonso retained and used the title of Visitador, Curador e Defensor do Reino (Overseer, Curator and Defender of the Kingdom). Rodrigo Afonso 1258 about 12 May 1272 Natural son; Prior of the city of Santarém.